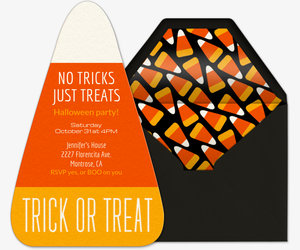 Gather the little monsters for tricks and treats this Halloween with free and Premium online invitations from Evite. 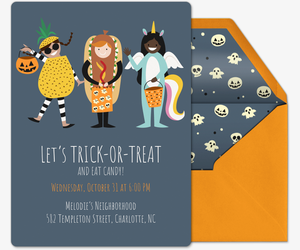 Our Halloween for Kids invitation gallery has invitations made just for juniors, featuring all the kids’ favorite Halloween elements, from candies and costumes to pumpkins and black cats. 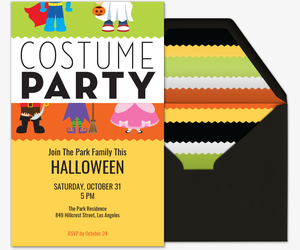 Whether your family is hosting a kid-friendly Halloween party at home, heading out to trick-or-treat, or carving pumpkins, our Halloween for Kids invitation gallery has an invitation to start your event. 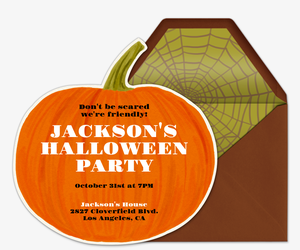 Planning a Halloween party for the grown-ups? 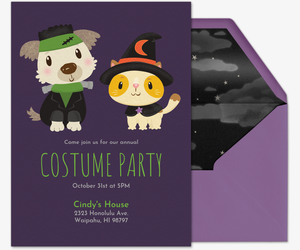 Check out our overall Halloween invitation collection. Our paperless invitations make it easy to manage your event. You can track RSVPs, manage your guest list, organize contributions, send messages, and post comments and pictures all in one place. No email address? No problem. Just send your invitation’s shareable link via text or post it on social media to reach all your friends. You can also feature a favorite photo of your munchkin on an upload-your-own invitation template, or DIY your own invitation completely with our design-your-own templates. 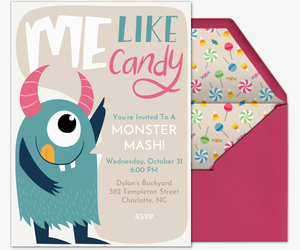 Prepare for wicked fun with our advertisement-free Premium invitations. Packaged in a matching digital envelope, our Premium digital invitations provide the same look and feel as paper invitations. Pricing for Premium invitations is determined by the size of your guest list. 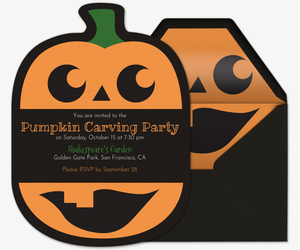 Prepare all the fun and games with tips from Evite Party Ideas. Check out our kids’ Halloween parties, DIYs, snacks, and safety tips. Not sure how to word your invitation? Read up on our wording tips and samples. Searching for another type of event invitation? Plan a Halloween party for your adult friends by browsing our overall Halloween collection, or send invitations for other fall occasions, like Watch the Game, Tailgating, Thanksgiving, Oktoberfest, and Holidays. Plan all your gatherings with the kids with Evite -- birthday parties, family gatherings, sports games, graduations, pet parties, and more.